30 2ND READER - cont'd least three Abraham Lincoln's born in Kentucky within a period of twelve years, two of whom had fathers named Thomas." 1ST SPECTATOR "That was a clever move on the 1st. Reader's part." 2ND SPECTATOR "Watch the Confronter...he didn't ask that question for nothing...he knew it was all recorded in the Book of Life." 3RD READER "The Book of Life does raise certain questions, and you must admit that the Book of Life does not state or record marriage contracts." 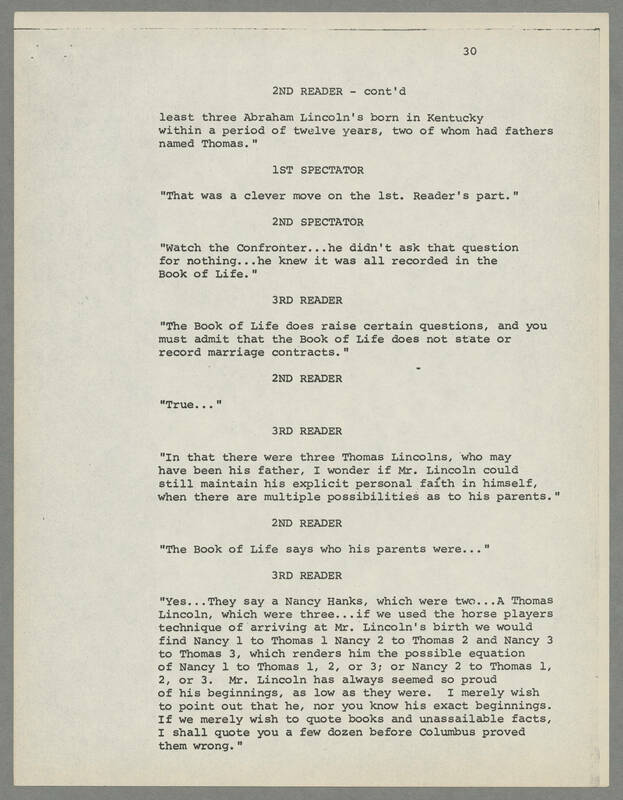 2ND READER "True..." 3RD READER "In that there were three Thomas Lincolns, who may have been his father, I wonder if Mr. Lincoln could still maintain his explicit personal faith in himself, when there are multiple possibilities as to his parents." 2ND READER "The Book of Life says who his parents were..." 3RD READER "Yes...They say a Nancy Hanks, which were two...A Thomas Lincoln, which were three...if we used the horse players technique of arriving at Mr. Lincoln's birth we would find Nancy 1 to Thomas 1 Nancy 2 to Thomas 2 and Nancy 3 to Thomas 3, which renders him the possible equation of Nancy 1 to Thomas 1, 2, or 3; or Nancy 2 to Thomas 1, 2 or 3. Mr. Lincoln has always seemed so proud of his beginnings, as low as they were. I merely wish to point out that he, nor you know his exact beginnings. If we merely wish to quote books and unassailable facts, I shall quote you a few dozen before Columbus proved them wrong. "